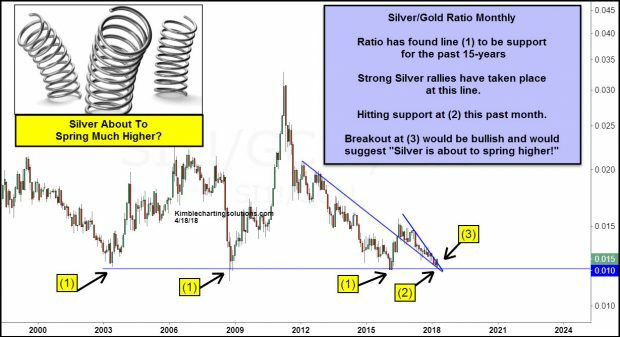 Silver-Gold Ratio… Set To “Spring” Precious Metals Higher? Metal heads have been very patient in 2018 as Gold continues to press up against breakout resistance. One thing that has been missing is Silver strength… but yesterday’s big move by Silver may be the lift that precious metals need. During bull markets for precious metals, silver tends to lead. Similar to small caps, it adds “beta” when bulls are in control. To measure this aspect, investors can look at the ratio of Silver to Gold. When this ratio is heading higher, it’s bullish. Lower is bearish. 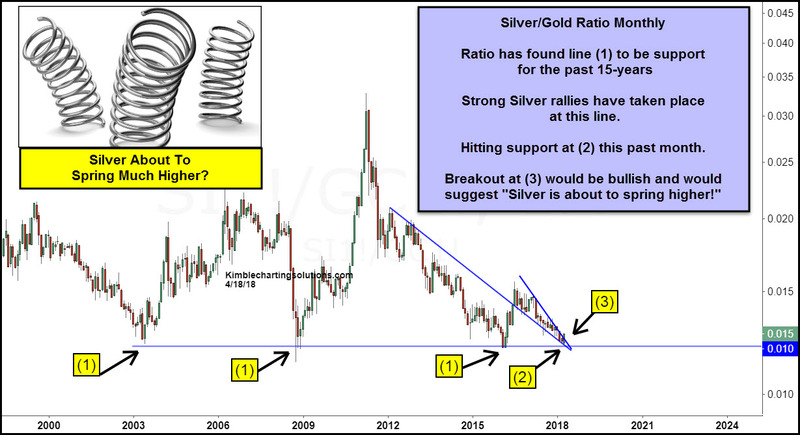 In the chart below, I look at the last 20 years of the Silver Gold ratio. Several advances started from a critical support line at (1). As well, the ratio has formed a bullish falling wedge pattern (2) and looks to be on the cusp of breaking out of the pattern (3). A breakout here would “spring” silver much higher, and likely carry gold with it. Precious metals investors need to be watching this ratio here!